A few weeks ago, I visited our new members class in order to talk about our congregation's youth ministry. Last week, I sat on a plane and wept (Think ugly cry) as I finished Addie Zierman's When We Were on Fire . I'm sure my poor seat mate thought I was crazy but it couldn't be helped. Addie's words moved me deeply. One of the greatest gifts my Mom gave me is a love of reading. I grew up in a house that was loaded with books and I loved reading, even as a small child. There's a story in the Gospel of Matthew about a woman who hemorrhaged for twelve years. It's not typically one we pay much attention to. This summer, my student leaders & I read and discussed the book, Help! I'm a Student Leader by Doug Fields. Using the questions below, we had some incredibly powerful discussions about leadership and faith. My youth ministry discussion tanked on Sunday. Every question I asked fell flat. Despite my efforts to pry responses out of my students, they remained universally unengaged. Linking up with Lisa-Jo Baker‘s Five Minute Friday. The rules: Write for 5 minutes flat – no editing, no over thinking, no backtracking. In the last several weeks, I've been ever so slowly working my way through Brene Brown's Daring Greatly . It's a book that's every bit as wonderful as everyone says it is. Whenever I walk into my neighborhood library, I run into a man. His tattered clothes, long scraggly beard, and excess bags reveal his identity as a homeless man. 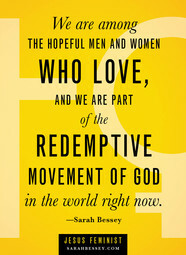 Like many of her fans, I fell in love with Sarah Bessey via her blog. Her writing is stunning; Her posts simultaneously heartfelt and provocative, oftentimes leaving me in both tears and deep thought. Youth workers live busy lives. As soon as one trip or program ends, the next begins. So it is with mission trips. I’ve been in youth ministry long enough to know that eventually, students in my ministry will face crises.